It is difficult not to get excited about the upcoming purchase of a new automobile; however, like any major purchases, it is on that should not be gone into lightly. After all, it is a big investment, so should you not do your best to purchase a vehicle that compliments and lends itself to your lifestyle? In recent years, the automobile market has become flooded; and not by new manufacturers, but rather, a seemingly endless supply of models and the classes that they find themselves in. Crossovers, LUVs, MUVs, economy cars, family cars, sports cars, the list goes on. However, not that long ago, and when viewed from a broader perspective, let us assume that there are two main types of automobiles: the sedan and the SUV. Typically it is between these two that most new car purchasers find themselves choosing between. However, it does beg the question as to what to base such a decision on and what are the advantages of each? Sedans typically are easy to drive on city roads and provide easy access to get in and out off. They have a lower center of gravity which affords them being at less of a risk for rolling over. In most cases they are less expensive than their larger counterparts, and also usually have better fuel efficiency. On the inverse, they don’t afford the same spaciousness as an SUV, along with minimal cargo room by comparison. For towing and hauling, sedans simply can’t compete with the more powerful SUV, and the high perched seats provide more driver visibility. Also, depending on where you live, SUVs are easily superior off-road and in poor weather conditions. SUVs, on the other hand, are usually stylish in addition to being a more flexible and reliable mode of transportation. They provide numerous safety features and can comfortably accommodate 5 to 9 people depending on the make and model. Their higher ground clearance makes them a great option for off-road and winter driving. Typically, SUVs are more powerful, which allows them to be put to work when it comes to healing and towing. However, their large size often makes them difficult to park and not ideal for tight city roads. Their high center of gravity makes them more prone to tipping and as a rule of thumb; they are typically gas guzzlers; making them quite poor when it comes to fuel economy – or are they? Most people are under the impression that the bigger the automobile, the poorer it is in terms of fuel economy, and for the most part; this assumption is correct. However, manufacturers have been breaking barriers and redeveloping the engines of the larger models in order to compete with a more fuel-conscious market and the ever growing concern of carbon footprints. As a result, the market is no flush with stylish, versatile, functional and now, fuel efficient SUVs. As a brand, Chevrolet has certainly seen their ups and downs, however, the past seems to be forgotten, or at the very least, provided a lesson learned for the American manufacturer. And a perfectly shining example of that lesson is evident in the Chevrolet Equinox. 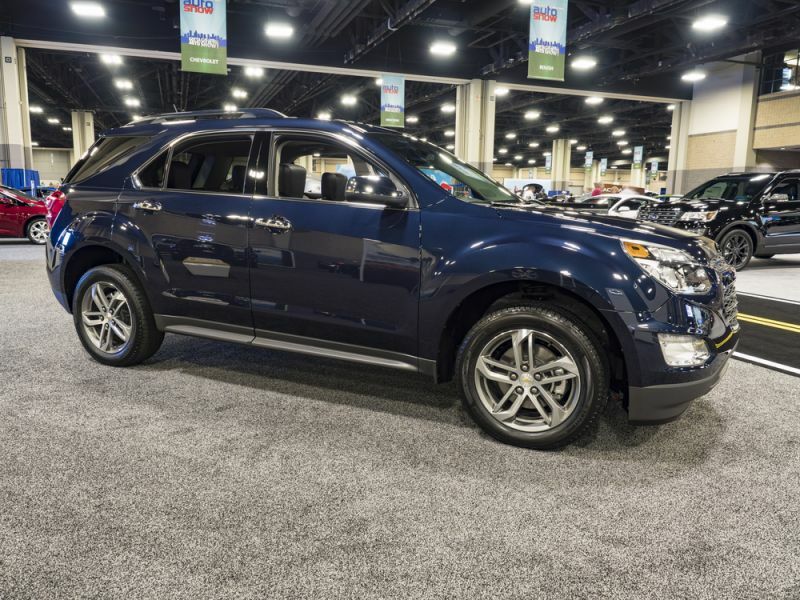 While it shouldn't even be considered in the same category as some of Chevrolet’s other SUVs, the Equinox is not only of a different breed in appearance but also what is has under the hood and throughout. Standard features of the Chevrolet Equinox LT include ECOTEC 2.4L I-4 182hp engine, 6-speed automatic transmission with overdrive, 4-wheel anti-lock brakes (ABS), side seat mounted airbags, curtain 1st and 2nd row overhead airbags, airbag occupancy sensor, air conditioning, 17" aluminum wheels, cruise control, ABS and driveline traction control, StabiliTrak electronic stability. Coming in at 21 MPG, the Equinox easily holds the title for Chevrolet’s most fuel efficient SUV, and arguably, also the most fun to drive.